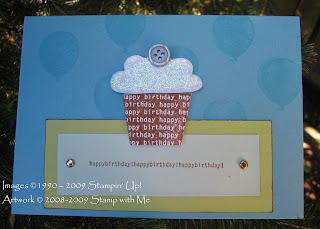 As promised, I am focusing on the Big Bold Birthday stamp set from Stampin’ Up! and have made this card for a special little boy. Note: Use Stampin' Up! Glue Dots to stick down the heavier embellishments like beads and buttons for extra sticking power and Stampin' Dimensionals to raise your selected stamped images! The balloons are stamped with same colour ink as the cardstock (both Tempting Turquoise) to give an illusion of background pictures. This is a great way to add features to your card without using more papers ... unless of course you like to use papers! Anyway, it was a simple card to make. Which is lucky really as I haven’t “found” my Craft Table yet – it is still covered in Christmas stuff waiting to be put away in the roof for next time!